John William Moyer, age 78, passed away as a result of a stroke on Saturday, February 2, 2019. John was preceded in death by his parents, Harry and Jesie Moyer of Verndale, and his brother, Charles. He is survived by his wife of 60 years, Glee, and five children: Valerie (Ken) Schmitz, Doug (Dana) Moyer, DeEtta (Daniel) Kujava, Janis Spencer, and Ken (Michelle) Moyer. He also has 18 grandchildren and 26 great-grandchildren. John and Glee spent over 54 years on the same farm in the Verndale area. He raised potatoes for most of these years and was often recognized by local and state officials for his work. In 1995 Moyer Farms was recognized as a University of Minnesota Farm Family of the Year. 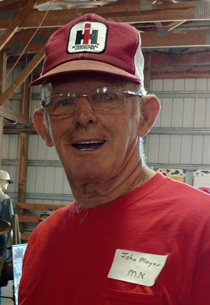 During his retirement years John stayed busy working the planting and harvest seasons on a farm in N. Dakota and restoring IH Farmall tractors. His hobby led John to restore over 15 tractors and small bulldozers. People from as far away as Alaska brought him tractors to be restored because of his expertise. John’s true legacy will be his willingness to give a hand to his neighbors and friends. Whether plowing snow for multiple neighbors or milking cows so a friend could go on vacation, he was quick to offer a hand and in doing so, leaving behind a heritage of selfless giving that serves as a model to his family. A visitation will be Tuesday, February 5, 2019 at the Karvonen Funeral Home, 419 2nd St NE, Wadena, MN from 5:00pm until 7:00pm. Funeral services will be held Wednesday, February 6, 2019 at 11am at the Verndale Family Life Church, 402 NE Clark Dr. Verndale, MN.